Click on an image below to go to the corresponding page. 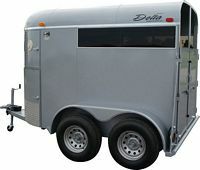 The Delta Bronco — A basic 2-horse straight load trailer with feed mangers & tack compartment. 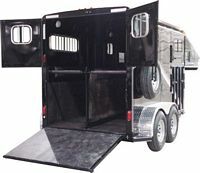 The Delta Thoroughbred — A specialty trailer designed with ramps for easy loading & unloading. The 600 Combo — A perfect slant-load trailer for trail riders. Includes dressing room area. The 500 Combo — A perfect slant-load trailer for trail riders. Includes dressing room area.